The West Linn boys swim team shocked Lake Oswego last week, beating the Lakers 86-84 on Jan. 11 at Lake Oswego District Pool, and in the process, handing Lake Oswego its first league loss since 2010. As tough as the loss was to take, the Lakers remained focused on their many successes and on the improvement they want to achieve by year's end. "I think we can do better. 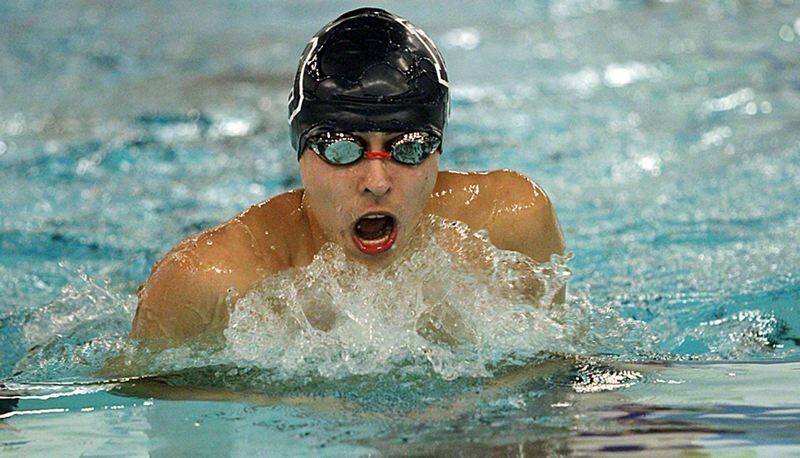 I think we can improve for district and state," said Lake Oswego senior Daniel Duran, winner of the 100-yard backstroke, runner-up in the 200 individual medley and a member of the Lakers' winning 400 freestyle relay. "I'm sure we can put up a fight. I know we had some absent swimmers today so I think we can do much better." "We are all in the swim club together — a lot of the fast swimmers from both schools are from the same club so we all know each other," explained Lake Oswego junior Andrew Liu, winner of the 100-yard breaststroke and the third-place finisher in the 200 individual. "We just entered for a friendly competition today." To show just how close the meet was, both teams thought that the winner of the day's last race — the 400 freestyle relay — would be the winner of the meet. And when Lake Oswego's boys — Quinn LaFond, Duran, Michael Bell and Matthew Bell — posted a winning time of 3 minutes, 28.05 seconds to beat West Linn's 3:28.50, everyone thought that the Lakers had escaped with their streak intact. But some 10 minutes later, after meet officials had gathered to confirm the scoring, it was West Linn that left victorious, improving their TRL record to 2-2 in the process. Lake Oswego's boys fell to 3-1. Duran did his part in the backstroke, winning in 58.02 to edge West Linn freshman Nathan Rumsey by .35, and earlier posting a 2:09.11 to take second in the 200 IM (trailing event-winner William Chun's 2:04.04). "I was amazed. I was surprised at my 100 back," Duran said. "I know (Rumsey) — he's one of my friends and we compete a lot in club — and he usually has a much faster time than me. I just stayed focused and I was applying everything I learned in training and I give him my all … for my team." Liu came through in the breaststroke, winning in 1:08.90 to edge teammate Chase Richardson by .26, and added a third in the 200 IM at 2:13.45. "We were all ready to go," Liu said. "Winning the 100 breaststroke felt really good." The Lakers had more success, too, with senior Michael Bell swimming 53.06 to win the 100 freestyle (with LaFond second at 53.61), and senior Doug Heymann taking top honors in the 500 free at 5:09.37 (with Michael Bell second at 5:20.60). Additional individual runners-up for Lake Oswego were: Matthew Bell in the 200 free; and Heymann in the butterfly. For West Linn, junior Kevin Vu came through with wins in both the 50-yard freestyle and 100 butterfly, while Lion junior William Chun won the 200 individual medley and Rumsey topped the 200 freestyle. West Linn's other two wins came in the relays, with Paul Muessig, Chun, Rumsey and Joseph Campbell taking first in the 200 medley, while the 200 free relay team of Chun, Campbell, Clay Barbee and Vu also grabbed first. Next up, the Lakers will swim against Newberg at Chehalem Aquatic Center at 4 p.m. Thursday.